4 stars of crazy, watery musical adventure. 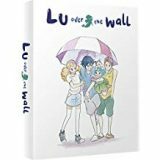 Lu Over the Wall is a Japanese animated film, featuring screenplay by Reiko Yoshida (A Silent Voice) and Masaaki Yuasa (Ping Pong: The Animation, Night Is Short, Walk On Girl), who also directs the film. It has all of his trademark strange animation style but this time it’s a children’s film, so it lacks his usual sinister undertones, which is actually rather nice. 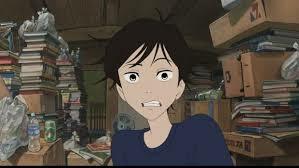 Kai Ashimoto (Michael Sinterniklaas – Eden of the East, Your Name) is a sulky teenager, moved from Tokyo to his father’s hometown, a small struggling fishing village called Hinashi. He is bored with school and his only joy is creating music and posting it online. He doesn’t have many friends, but one day two of his schoolmates, Yūho (Stephanie Sheh – Bleach, Eureka Seven) and Kunio discover his talent for music and ask him to join their band Seiren. The locals have many superstitions regarding merfolk and their liking for human flesh and have set up a giant wall to keep them away from the village. The band have found a way through the wall so that they can practice in secret on Merfolk Island. 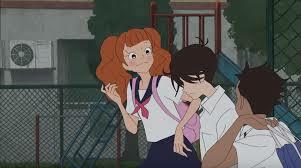 It is during their first rehearsal that they meet the bubbly Lu (Christine Marie Cabanos – Puella Magi Madoka Magica, Erased), a mermaid who is attracted by the music. She gets on really well with Kai and soon helps to bring him out of his shell. She even helps them out with the band, singing and dancing with them, but when the townsfolk realise what she is, old animosities are reawakened which could have disastrous consequences for everyone concerned. 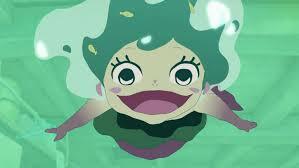 Lu Over the Wall is a very interesting film, which bears Masaaki Yuasa’s stamp all over it. It’s idiosyncratic style makes it very endearing and the human characters are surprisingly relatable, although some of the others are decidedly odd, a Merdog and a giant humanoid shark for example. It is a real feel good film, which will have your toes tapping right to the end. Well worth adding to your collection. Lu Over the Wallis available to buy now on Collector’s Combi Blu-ray and DVD.